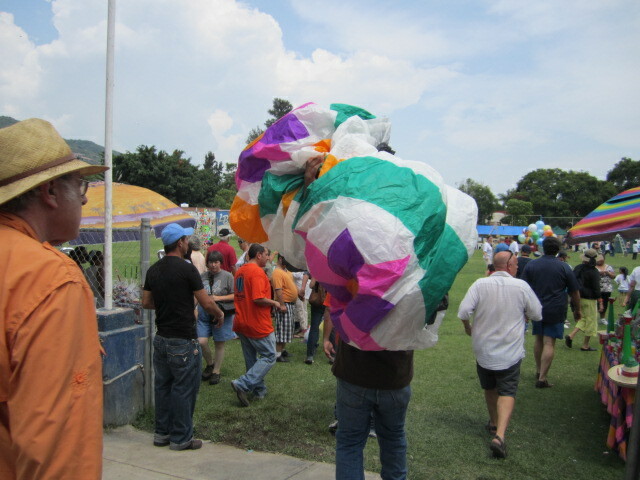 Every year there is the Regatta de Globos, hot air balloons. 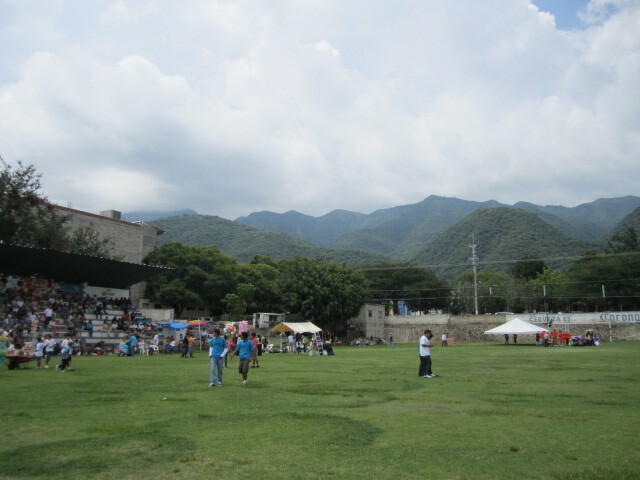 It is held in the main soccer field on Revolution street in Ajijic. 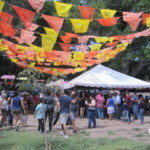 It is one of the most popular events of the year in Lake Chapala and is always held on the Saturday before Independence day (Sept. 16.). 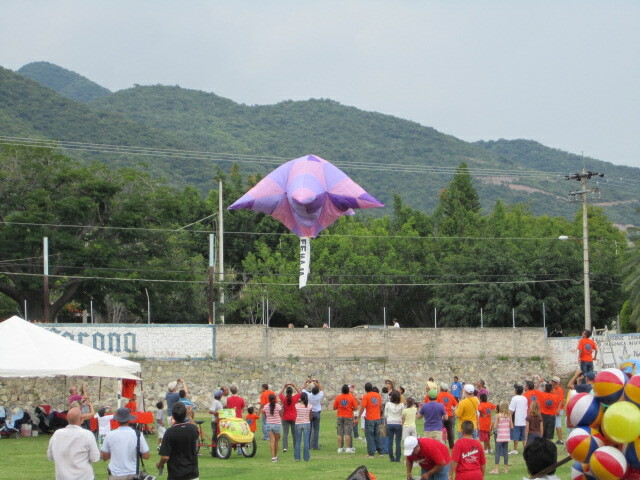 The Globos are made weeks in advance by various groups of volunteers. Some of them are sponsored by local churches. Some are sponsored by businesses, or clubs. 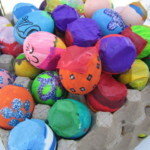 The smaller ones take about four hours to make. The larger ones can take much longer. Hundreds of these Globos are made for the event. Some burn up before they can even get off the ground. Others will stay in the sky for hours and even float miles away. In past years, a few have come burning down onto farmers’ crops. Then the sponsor of that unlucky Globo has to pay the farmer for his burnt up crop. That doesn’t happen often. The event started at three in the afternoon but the first Globos didn’t go up until closer to four. I enjoyed being there early, before the crowds came. It was overcast most of the day and we even had a little rain. 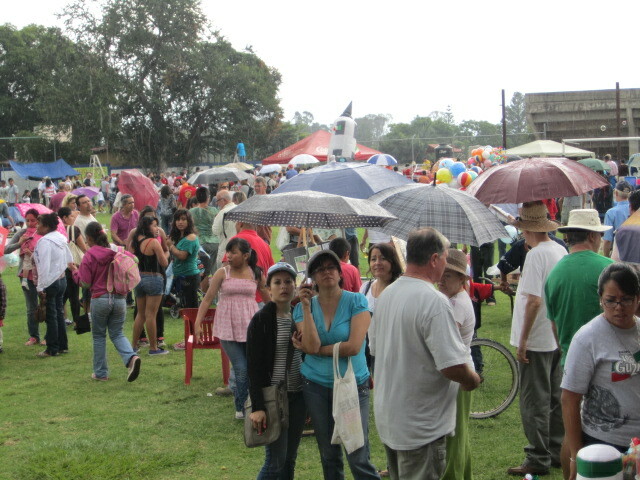 I didn’t see anyone leave the event because of the rain. It was too important to miss. Everyone was having too much fun. This is the rainy season so no one was surprised to see rain in the afternoon. If you look at the mountains in the background, you can see how beautiful and green they are now. This photo was taken at the beginning of the event. At the end, there are too many people to even see the green lawn. I have a photo of that at the end of this article. 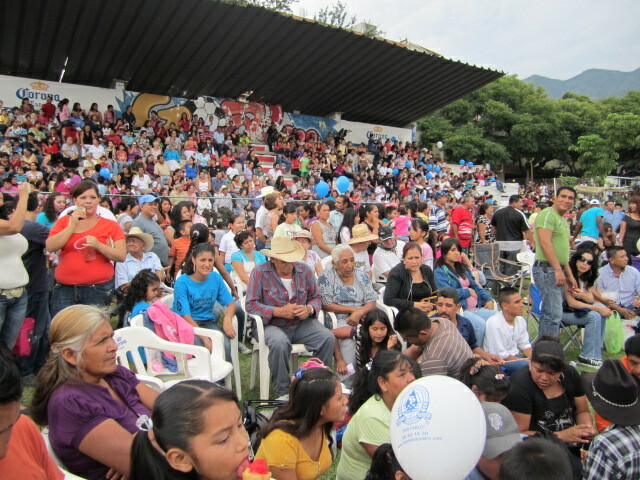 Above is a photo of a group waiting for the event to start. They are all wearing white T shirts with a logo on each one. This is not a high pressure event. 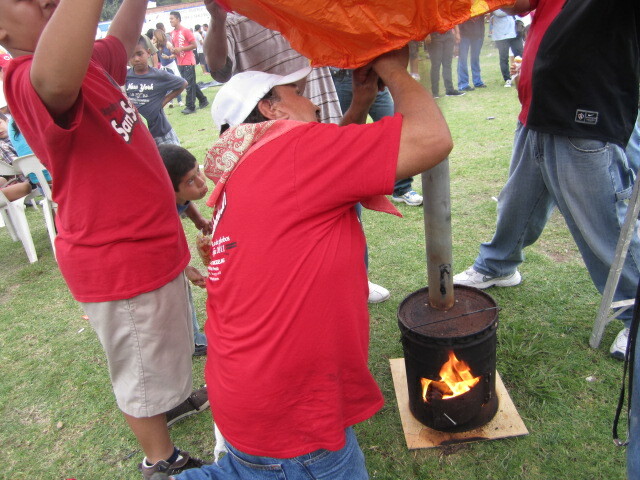 If their Globo burns up before it gets off the ground, no big deal. The event is free, unless you want to make a donation. It is not for competition but for fun. 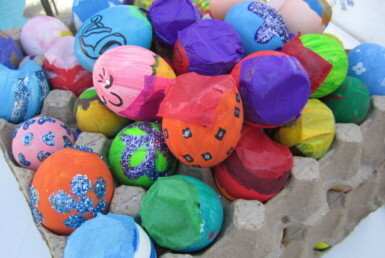 As you can see by the above photo, the Globos are just glued together sheets of colored tissue paper. They are extremely fragile. 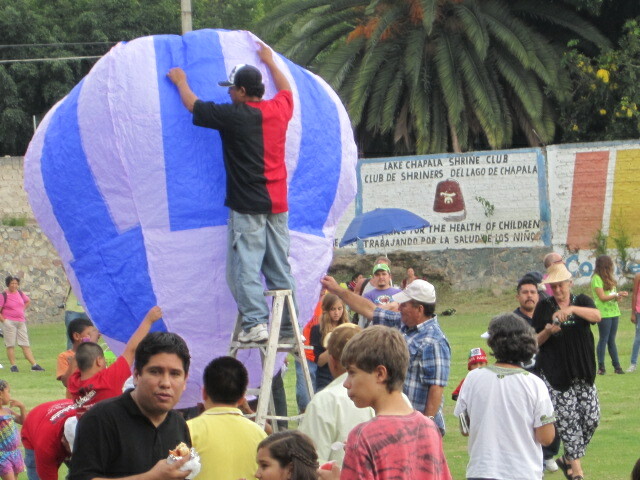 Most of the Globos are too large to put up without the use of ladders. 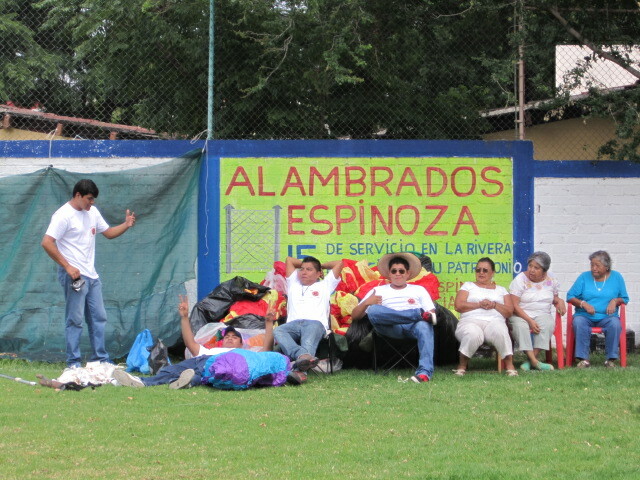 Each team wears matching colored T shirts. That makes it easier to see who is working and who is just watching. Anyone can walk out onto the field and give advice or get in the way. 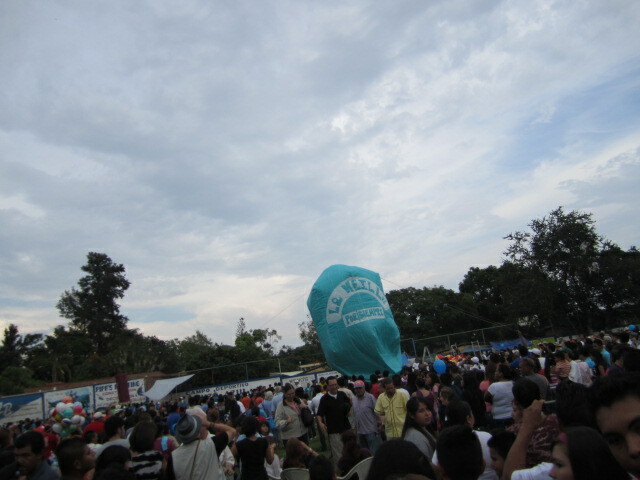 Several small Globos were sent up at once. Two of them burn up right away. 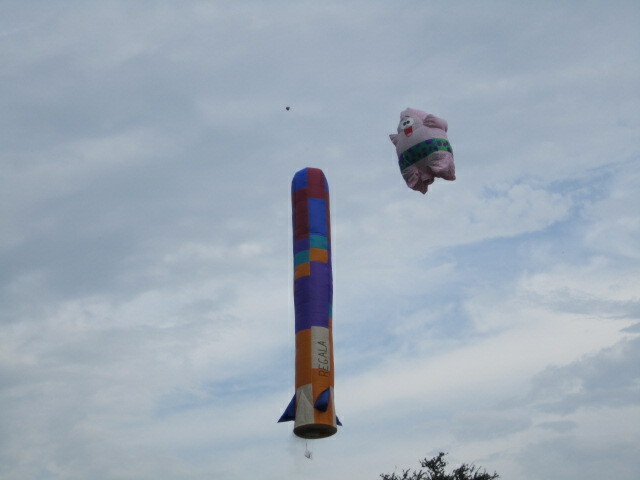 The third one went up with much admiration from the crowd. It is exciting to watch the Globos floating away. They are so fragile that is seems like a miracle each time one stays up. 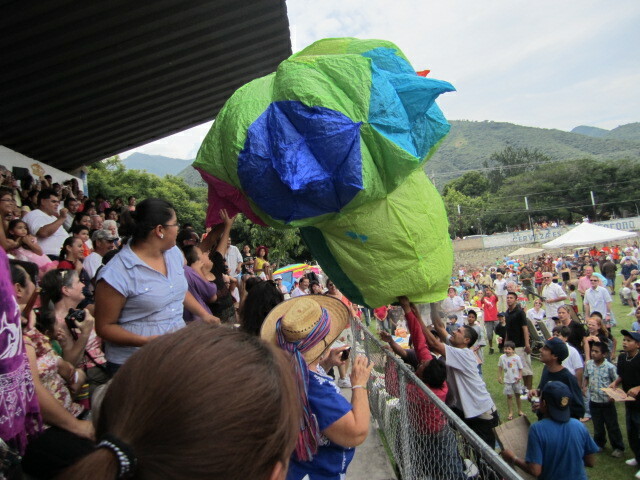 The crowd became like one entity, moaning when a Globo burned up and Ahhing when one made it into the sky. It was exciting to feel a part of such a large group of diverse people. 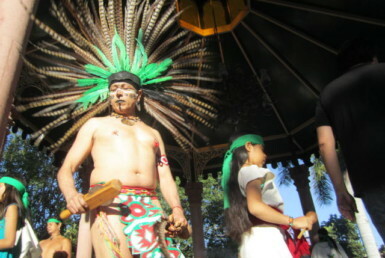 Both Expats and Mexicans attended the event. It was a peaceful event. I didn’t see anyone drunk and disorderly or aggressive. I saw two policemen but they were enjoying themselves too. 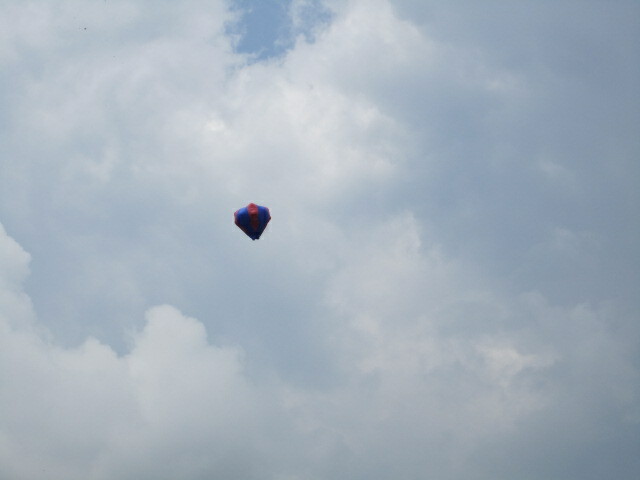 I thought the above Globo was pretty and I was glad it didn’t burn up before it got into the sky. The umbrellas came out in the rain. People were prepared this year. At a distance, it is impossible to tell how large the Globos are and I had conversations with two friends who thought they were actual hot air balloons with people riding in them. They had never attended this event. They don’t know what they were missing. The above Globo wasn’t so lucky. It went into the bleachers. Some people backed away from it because of the possibility of it catching on fire. Fortunately, the sponsors were able to direct it back out onto the field and it finally rose with much background cheering from the crowd in the stands. Sometimes several Globos go up at once. That is always exciting. They come in all different shapes and sizes. Children love this event. 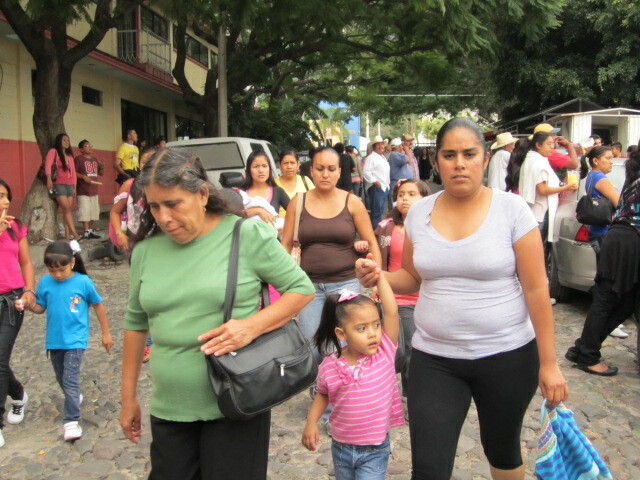 Many families were there. 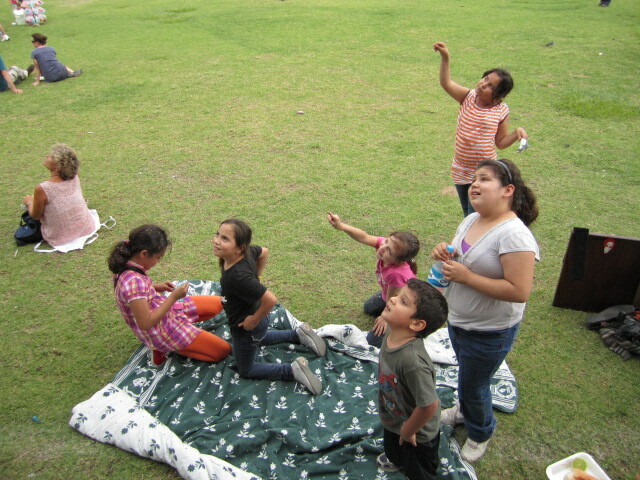 I loved seeing the sense of wonder in the eyes of the children as they watched the Globos going up. 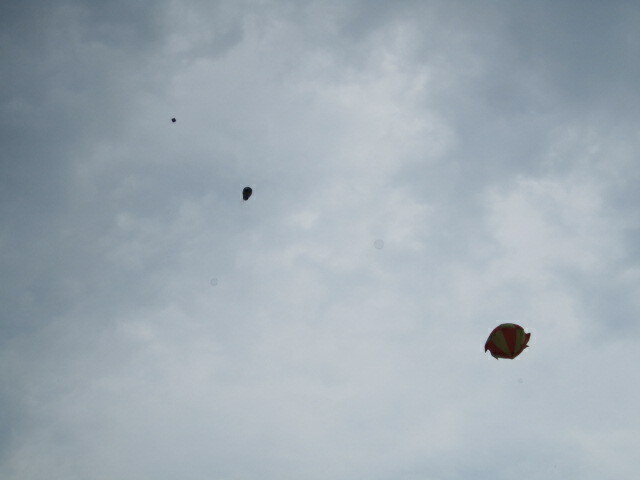 You can see from the above photo how they get hot air into the Globos. 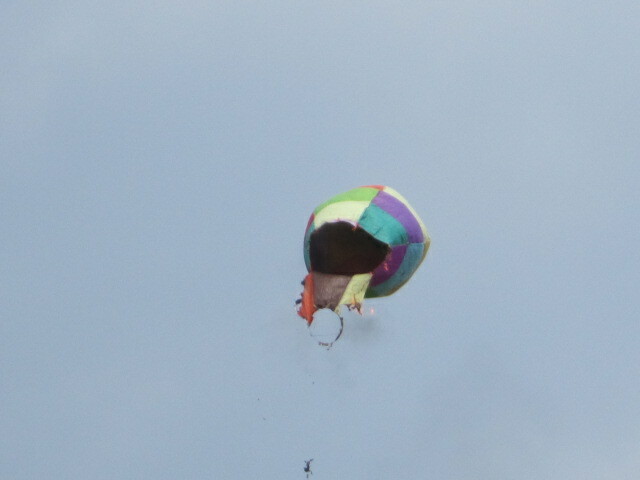 This is a fragile time because if the Globo is blown to one side it can quickly catch on fire and burn up. 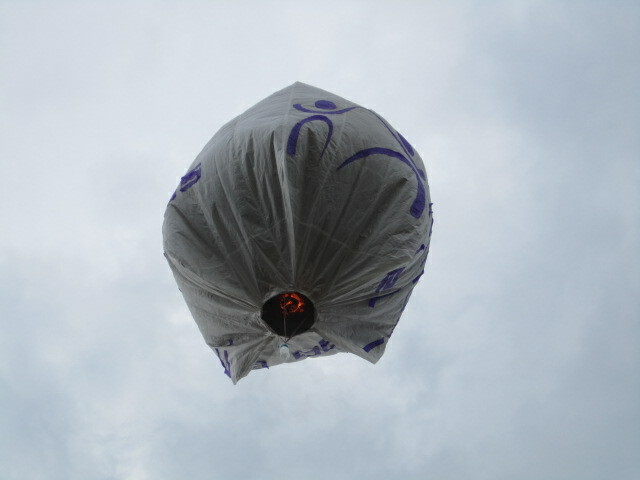 There is usually a section of kerosene soaked cotton at the bottom of the Globo that keeps burning. If the Globo tips to the side too much it catches fire and burns up. The above photo was taken much later on in the afternoon and you can see that the field is crowded. There must have been several thousand people at the event. 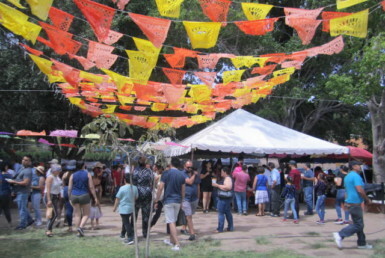 There were many food booths both inside the gate and along the street. 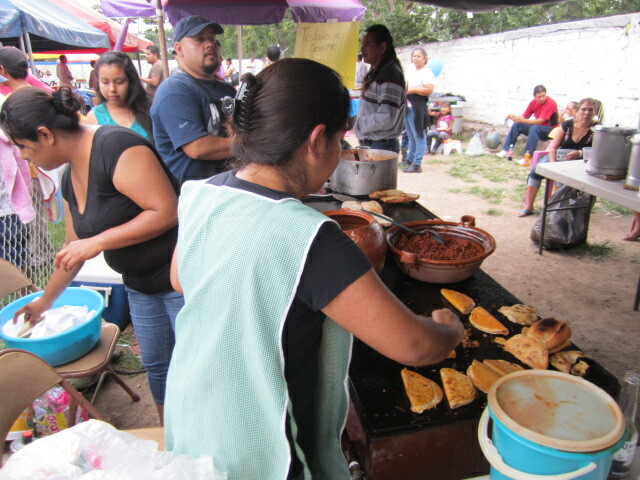 Vendors were also tripping over the crowd in the stands with their different food for sale. No one seemed to mind. The above photo was also taken later in the afternoon. It was extremely difficult to get around at that point. I finally left after several hours. My neck was getting sore from looking up. As I was leaving, many people were still arriving. The event went on for a few more hours. 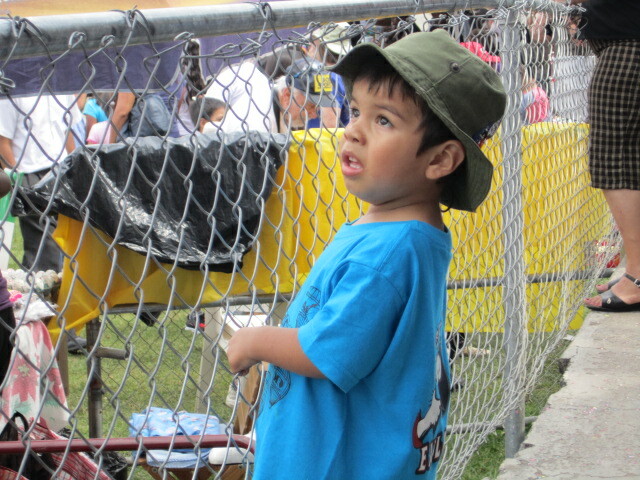 I could hear the crowd from my casita but I was too tired to go back to the event. I will wait until next year.